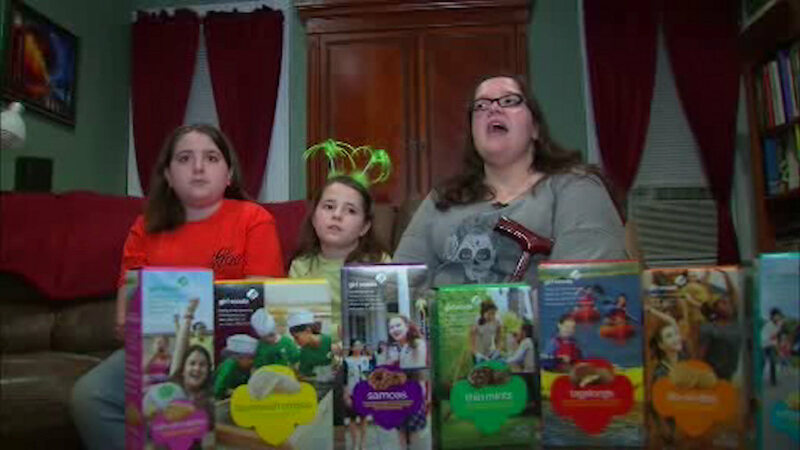 SCOTCH PLAINS, New Jersey (WABC) -- Two young sisters in New Jersey are experiencing a windfall of Girl Scout cookie orders after word spread about a nasty encounter they had with a potential buyer. 12-year-old Natalie Skolar and her 9-year-old sister, Angelina were verbally assaulted by a woman while going door to door in Scotch Plains. The woman yelled and cursed at them, claiming no one wanted their cookies. Their community is now proving the woman wrong. "It was just a weird, scary kind of thing," Natalie said. "She just closed the door at us and said, 'I don't want any of those Girl Scout cookies!' except she said the F-word before that," Angelina said. A worker at the Fanwood Police Department saw a Facebook post about the girls' rude encounter and began passing around a cookie order sheet. That started a buying boon. The girls have now sold hundreds of boxes of cookies.